Tel Alviv University researchers D. Genkin, L. Pachmanox, I. Pipman and E. Tromer have released a paper this year detailing their research on extracting encryption keys from PCs via their unintentional radio emissions. They say that they have been able to demonstrate their work by extracting encryption keys from GnuPG on laptops within seconds by using their non-intrusive wireless methods. GnuPG is software which allows you to encrypt and sign your data. fully extract decryption keys, by measuring the laptop’s electromagnetic emanations during decryption of a chosen ciphertext. 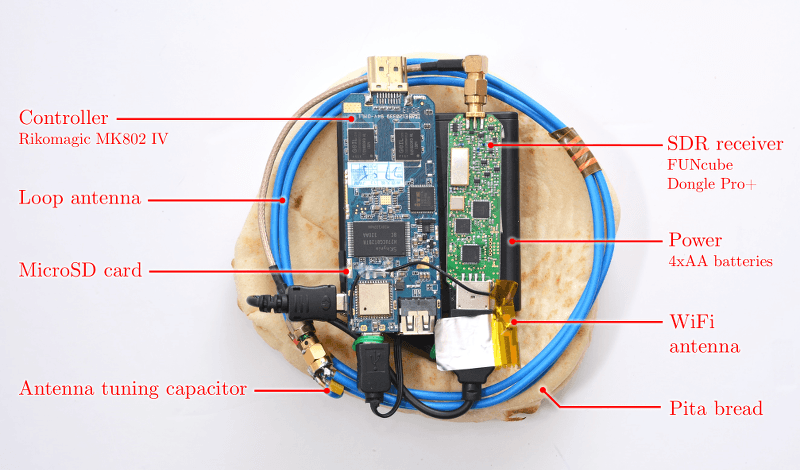 In their experiments they used a Funcube Dongle Pro+ to measure the unintentional RF emissions coming out of a laptop computer at around 1.6-1.75 MHz, but they also mention that a low cost RTL-SDR with upconverter could also work. Different CPU operations have different power requirements. As different computations are performed during the decryption process, different electrical loads are placed on the voltage regulator that provides the processor with power. The regulator reacts to these varying loads, inadvertently producing electromagnetic radiation that propagates away from the laptop and can be picked up by a nearby observer. This radiation contains information regarding the CPU operations used in the decryption, which we use in our attack. Recovering CPU assembly code operations from its unintentional RF emissions. In addition to the above they were also able to create portable attack hardware by connecting the Funcube Dongle Pro+ with a small Android based embedded computer called the Rikomagic MK802 IV. They also show that they were even able to perform the portable attack with a standard AM radio with the output audio being recorded with a smart phone. A portable version of their attack set up with the Funcube Dongle Pro+ and microcontroller. The researchers write that they will present their work at the CHES 2015 conference in September 2015. 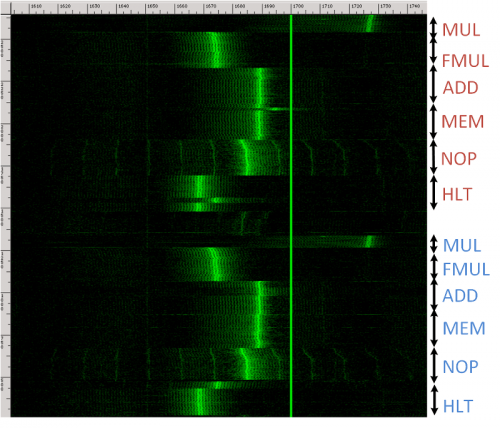 Previously we also posted about Melissa Elliots talk on unintentional RF emissions, Milos Prvulovic’s work on spying on keyboard presses from unintentional RF emissions and also a security flaw discovered with some HP laptops which caused them to unintentionally convert audio picked up from the microphone into RF signals. Last year Milos Prvulovic, a computer science researcher uploaded some videos to YouTube showing how he was able to remotely and covertly record the keystrokes of a target laptop in another room wirelessly using just a software defined radio, magnetic loop antenna and some custom software. The target laptop was first modified with special drivers that cause increased and unique memory and processor activity for each key that is pressed. As computers emit unintentional RF emissions, the modified memory and processor activity causes the target laptop to emit a unique RF signature for each key pressed. Milos used this fact to create a program that can detect the RF emissions from the target laptop, and show the key presses made from the target laptop on the spying PC. Pytacle, a Linux tool used for automating GSM sniffing has been updated to alpha2, and now supports the RTL-SDR dongle with this update. Melissa Elliot (0xABAD1DEA), an infosec security researcher has uploaded slides on the topic of investigating unintentional radio emissions from various electronic devices, and the security issues these emissions can cause. 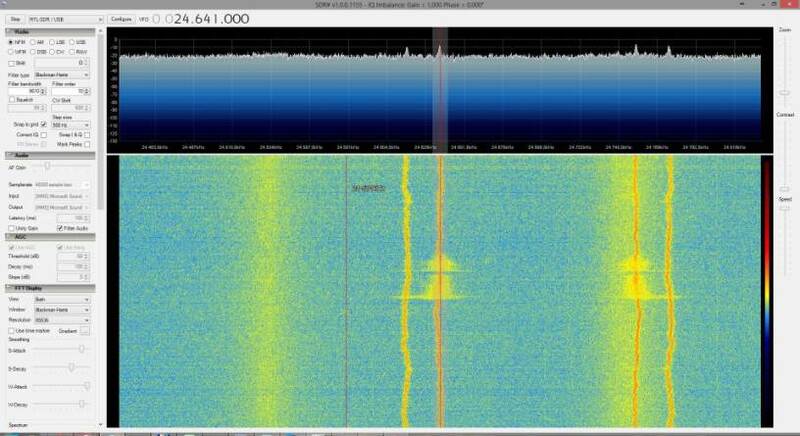 She used the RTL-SDR as the radio receiver to show that sophisticated equipment isn’t needed. 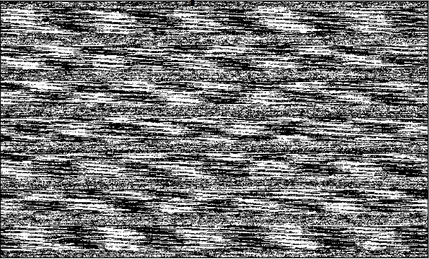 One interesting experiment she performed was trying to recover a checkerboard image displayed on an LCD screen entirely via its unintentional radio emissions received with the RTL-SDR. She got close, as you can sort of make out the checkerboard pattern on the recovered image below. Update: Tomsguide have written an article on Melissa’s talk.